The ski season was a little above average for snow and conditions were good or excellent from Thanksgiving through March. The winter visitor count will probably be a new record. So 2015 is off to a good beginning. More properties have sold in every month so far this year than last year, extending a streak that began last May. 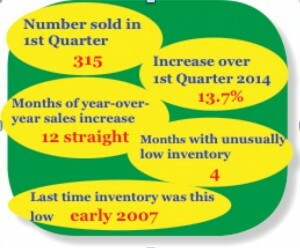 At this pace, this year the number sold could reach the 25 year average of about 2200 sales. This would be the first time since 2007 that there have been an average number of sales. This will also be the first time that there have been 300 or more sales in the 1st Quarter since 2008. The average sale price in the 1st quarter was $517,100, about 2% lower than last year to date. The slight decline is due to several expensive new condominiums at Breckenridge selling a year ago making March 2014 prices higher than any other month last year. Even so, average prices this March were the third highest in Summit County history. 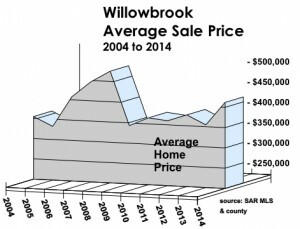 Some neighborhoods are closer to the peak prices of 2008 than others. Some never fell very much and have stayed close to the peak for all these years. Others still have a ways to go but are rising rapidly. Willowbrook prices, for example, are higher than all but 2007 and 2008 and are above $400,000 for only the 4th year in history. 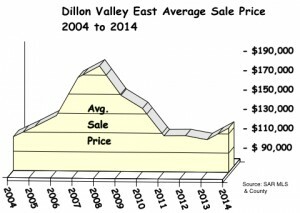 On the other hand, Dillon Valley East prices are still only two-thirds of the way back to the peak of $179,500 in 2008. 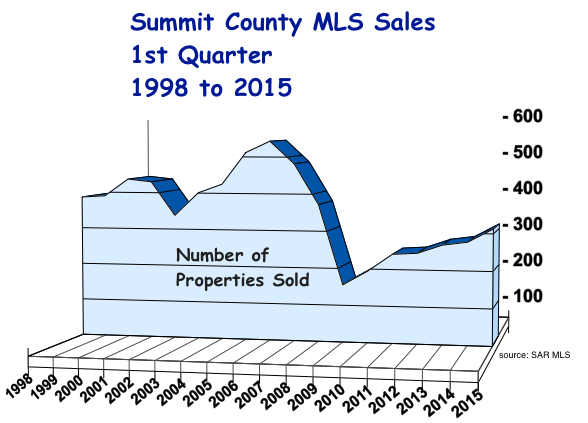 The severe shortage of properties for sale in Summit County continues into the 2nd Quarter. There have been fewer than 1200 properties for sale since late November. Having sold nearly 1900 properties last year, there has been about a 7 month supply. About 350 of those properties for sale are vacant lots, however, making the stock of improved properties even tighter. In the first part of the 2nd Quarter, properly priced properties are lasting only days on the market and new listings are barely keeping up with sales. There are many potential sellers who are waiting for another property to come on the market so they can move. This has increased the number of contracts contingent on selling the old property. Everyone is more or less frozen in place waiting for inventory to increase. Most owners who would like to sell after the typical 7 years of ownership are waiting for prices to climb back to the levels of the year they bought. Seven years ago prices were the highest in history and the overall market is not back there yet. Those owners are staying out of the market because they don’t have to sell even though they want to. So we are down to those selling for other reasons: health, death, long time ownership, lots of equity. That appears to be less than half of the seller pool. Fortunately, there are only three years (2007,2008, 2009) in which prices were higher than right now. Unfortunately, over 5100 folks bought in those three years. That’s a large supply waiting to enter the market. Normally, scarcity of product would force prices up quickly. However, the reluctance of appraisers and lenders to approve prices very much higher than the last sale keeps the lid on appreciation. Both appraisers and owners are waiting for each new sale to close at a slightly higher price than the last sale. This makes for a really slow recovery of prices. As long as these conditions last it will be the best time for sellers in several years. It could take until late next year for the inventory to normalize and that assumes a 6 or 7 percent price increase this year and next. For now, it is as close to a seller’s market as we have seen in a decade. It only took 25 years, but Summit Cove will finally have cell phone service… A new “stealth” site will be built at the Summit Cove Fire Station matching the existing building so well you won’t even know what it is. 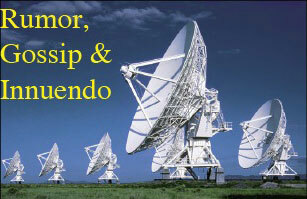 Soon we’ll be joining the Third World and the 21st Century in communication capability. What next? Lane lines on the roads? Pavement? Bet you didn’t know that it was illegal to collect rain from your roof in Colorado… but thanks to the visionary folks in the State Legislature, now you can drink your fill or water your garden the next time it dumps. Determined to catch up with the times, legislators are now working quickly to change the law prohibiting overnight buggy parking on public roads. Whale oil lamp legislation coming soon! The tubing hill at Frisco will never melt… we’ll be tubing on the 4th of July! You can see it from I70, a white ribbon in a sea of brown and green. The hill has been a major success and the idea of offering beginner ski lessons there is brilliant. What better way to start than on a small friendly hill with no chair lift or rippin’ snowboarders breezin’ you at 90 MPH. It’s always a surprise to go outside the day after Easter… and find the streets deserted, the grocery store quiet, no line at the gas pump and a general sense that you are all alone in Summit County. Of course the other 35,000 residents feel that way, too, but the illusion is nice. Oh, and less people making right turns from the far left lane… priceless! And the osprey are back… at the Eagles Nest road entry. The town home sized nest blew down last fall after they left and there was some question if they would return to rebuild. Unfortunately, another couple weren’t so lucky. It looks like a pair of bald eagles usurped their nest out north of Silverthorne. Drama in the mountains. I see a reality show here, folks. 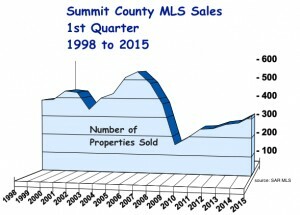 Judging from the local newspaper ads, several real estate companies in Summit County are absolutely the top producers. Each of them has either the most listings (although I’m not sure this is something to boast about – why aren’t they sold? ), the most sales over $1 million, the most sold on Thursdays during a full moon, etc. So how is a buyer or seller to choose? The first thing to remember is you are choosing a person, not a company. Gigantic Real Estate may sell twice as much as every other company in town, but how many brokers does it take them to do that? If Gigantic sold 200 properties last year, that sounds like a lot of business. If they have 50 brokers who each sold 4 properties, that’s different. Millennium 42 Real Estate has a nation-wide referral network that will bring buyers flocking to your door. But that network is geared largely to relocations between urban areas. We don’t have any of that. I can tell you from personal experience, brokers generate their own referral network. Companies, not so much. But wait…the actual broker you choose to work with is essentially a sole proprietor. The other 39 brokers in his or her company are concentrating on their own business. They may get a commission incentive for in-house sales, but they aren’t worrying about how to sell their colleague’s listings. They’ve got their own to think about. So it’s all about how good the broker you work with is, not how big and loud their company is. How many closings did your broker have last year? How many of his listings sold last year? How long has she been a Realtor? In Summit County? How much did your broker spend on their business last year? How much of your broker’s business comes from past buyer and seller referrals? How much continuing education and what professional designations has your broker achieved? A full-time professional Realtor should be selling at least 12 to 15 properties a year. The majority of those sales should be their listings whether sold by them or another broker. Listings are the key to a successful real estate career because they generate the referrals and future business. And your broker should have a system in place and people to run it that make the process as easy and stress-free for you as possible. Believe me, the top producer at Big Time Brokers has her own staff, essentially runs her own office and pays for all of it. And gives part of every commission to Big Time for the privilege. That’s why top producers eventually go on their own. They’re doing it all and paying for it all anyway. You are choosing a person to work with, not a company. Your broker is the one who will do the job, not Gigantic Big Time Millennium Real Estate Company. So just tune out the noise and go find a seasoned pro. When you go un der contract to buy a residence, you usually have about ten days to two weeks to get an inspection done. Whether you choose to hire an inspector or do it yourself, your choices are then to either write an objection for the seller to consider or to terminate the contract with no penalty. Buyers nearly always pay for the inspection and are always responsible for any damage to the property done during the inspection. 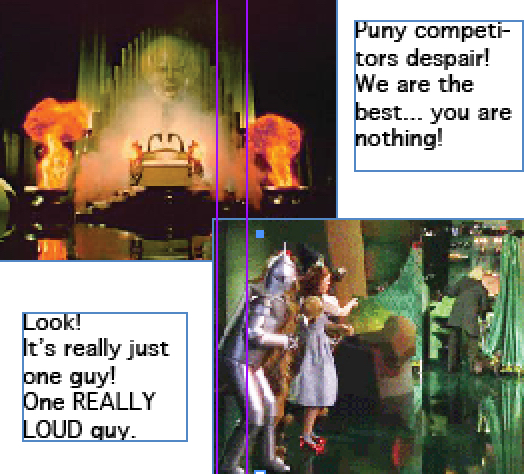 And you wouldn’t believe some of the stuff inspectors have done to damage property. That’s why it’s wise to ask your Realtor who is currently on the good list for home inspections. It changes. Inspection objections should be limited to items of safety, habitability and working condition; items that you wouldn’t be expected to have seen while you were deciding to buy the property. 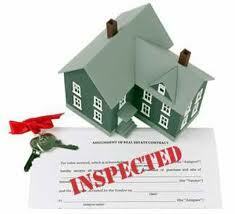 The inspection is not meant to require the seller bring the property up to today’s building codes. Cosmetic items are generally not fair game for inspection objections. And the inspection is not the buyer’s opportunity to renegotiate the contract price. It is rare that this is attempted. Certain items are always called out by inspectors. GFI electrical outlets at sinks and decks, carbon monoxide detectors (even when already installed), chimney cleaning for both gas and wood fireplaces and lately, a full annual heat system service and inspection are currently on every inspector’s report. Sellers can pre-empt some or all of these by just doing them when the property goes on the market. Even if the inspector includes them to cover himself, as often happens, you have already done the work and have receipts to show it. Fogged thermo-pane windows are a problem. The window still works and the place is habitable, but it looks bad. Is it cosmetic or functional? Depending on the number and cost of the items on the objection list, sellers may or may not address fogged window panes. Sellers often ask if it makes sense to get an inspection before the property goes on the market. Generally not. Buyers still want their own guy to look the place over and may refer to your inspection report, but it won’t stop them from getting it done again. Sellers who think there may be a lot wrong with the property might want to get the inspection done just to find out what they’ll be hit with by the buyer’s inspection. But the buyer will still get another one. So even if you didn’t get an inspection when you bought the property, don’t expect a new buyer to waive the inspection. It’s just part of the normal closing process these days. And buyers… Please remember, it’s a used house. The price probably reflects the condition. Yay! It’s Tax Revaluation Time!! It’s so exciting. It’s the time we all wait for… like Christmas! Every two years, the County re-assesses all properties to determine the basis for the next property tax bill. When the new property valuations arrive in your mailbox in the first week of May, your property’s value will probably be below what you think your property is worth. So before you call the assessor or your Realtor to find out why when you’ve just been reading about our recovery, read this. Your new valuation is what your home was worth last year, not what your home is worth today. Valuations are based on the 24 month’s sales from July 1, 2012 through June 30, 2014. That covers the years when prices were basically flat at 2011 levels. You can expect that your home will be valued less than it’s value today. 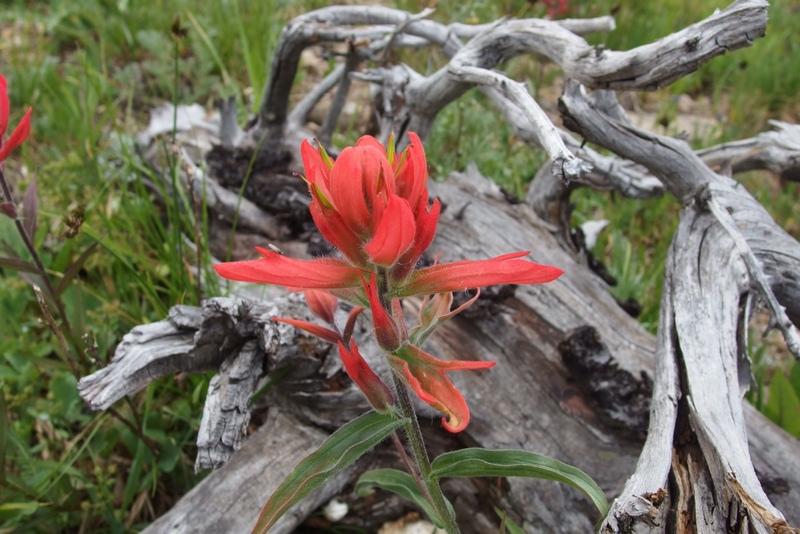 The Summit County Assessor says that about two-thirds of our owners are from somewhere else. Those from Florida or other depressed areas will not be pleased when the Assesor says their property has gained value. Sorry. Prices never fell as much as in many other areas and have increased slightly since the bottom in 2011. Even if your valuation increased by 30% (highly unlikely) it doesn’t mean your tax bill will go up 30%. Various state laws limit how much government can collect each year. To keep our property taxes in perspective, remember that in many states it can cost several times what we pay for taxes on similar types of property. For example, a 3100 square foot home in Summit Cove paid about $1800 in property tax last year. In New Jersey they might pay $10,000. You have until May 31 to protest, but unless you can bring comparable sales proving that the County is wrong, your valuation will stand. Go to my web site and look under Neighborhood Sales & Listings for the red Tax Comps button for your neighborhood. You will see all sales from the tax valuations period. So you have two more years of grace before tax valuations actually will cause your bill to increase. Enjoy them.